While summer may be prime time for folks to leave their offices and enjoy a few weeks’ vacation, the fall season has its own unique charms. In Branson, Missouri, the cooler weather and smaller crowds encourage a slower pace, while the town and surrounding areas have no shortages of things to see and do. To ensure that couples and families can make their vacation dollars really stretch, travel reservation company Reserve Branson offers discounted tickets and package deals for all of Branson’s great attractions. Branson has earned a national reputation as a family-friendly, dynamic and memorable destination for couples and families. Tucked away in the Missouri Ozarks, the Midwest’s premier vacation hotspot combines natural wonders with entertaining attractions for all ages. For a complete rundown of everything Branson has to offer, visit http://www.reservebranson.com. Major events this fall include the National Harvest Festival at Silver Dollar City, an 1880s theme park in Branson. A Western-themed spectacle, audiences will be wowed by the Texas Trick Riders and their unrivaled horsemanship. Craftspeople and performers from around the country will be on hand throughout the festival, which runs from September 12 through October 26. In Branson proper, the 40th Annual Autumn Daze Arts & Craft Festival will be held downtown from September 19 to 21. Visitors will enjoy demonstrations of traditional craft techniques, a free live concert and street dance, and an enormous food court. Autumn Daze is a celebration of the town’s rich and diverse history. Local craftspeople and artists make up the bulk of the more than 100 artisans who will line Commercial Street. In addition to Branson’s well-known parks and attractions, the surrounding countryside has plenty to offer adventurous travelers. 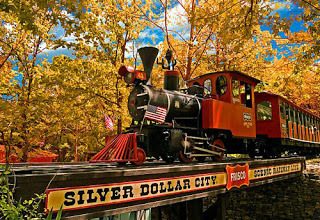 As the leaves change from green to myriad fiery shades of red, yellow and orange, a relaxing trip along the Branson Scenic Railway offers storybook scenes. This picturesque woodland can also be explored on foot or on a bike, and the cool fall weather means sojourners of the outdoors won’t be battling stifling heat and humidity. Other pursuits, such as riding a zip line or playing a round at one of Branson’s fun, challenging public golf courses, are even more enjoyable when nature turns down the thermostat. Branson is conveniently located right in America’s heartland, a few hours’ drive from major cities like Memphis, Kansas City and St. Louis. Vacationers can now even reach Branson by air; in March, Southwest Airlines added Branson as a destination. Thanks to Reserve Branson, booking a trip to “The Live Entertainment Capital of the World” is a snap. Anyone can shop for and select an affordable vacation package direct from the company’s website: http://www.reservebranson.com/branson-packages. Reserve Branson offers bundle pricing on multiple attractions, shows, and lodging. There’s no need to worry about booking through various agencies or keeping track of lots of paperwork. Additionally, package deals are a definite money saver, an important consideration for budget-conscious couples and families.